Gilbert Faraday Collett was born at South Hamlet, Gloucester on18th July 1879, the son of a chemical manufacturer. As a boy he lived at Hawkesbury Villa, Longford St Mary, Gloucester. By 1891, the family had moved to 7, Brunswick Square, Littleworth, Gloucester, but in the census, age 11, Gilbert is recorded as a boarder at Sidcot, a Quaker school in Somerset. He later continued his education at Cheltenham College, where he was a contemporary of F M Luce, who also played for Gloucester. Collett went on to Cambridge University, where he won a Blue for rugby in 1898, whilst Luce did likewise at Oxford. They both played for Gloucester at centre three-quarter. Collett (and Luce) were thrown in at the deep end when they started their playing careers with Gloucester away at Swansea on 15th January 1898, when Gloucester went down 3-19. That proved to be Collett’s only appearance for Gloucester that season, but he did also make his County debut for Gloucestershire against Glamorgan. He played in 7 matches the following season, 1898-99, scoring his first try for the Club and kicking 5 conversions. Most notably, he (and Luce) played in the famous first victory over Llanelly at Stradey Park on 14th January 1899. As news of this result filtered back to Gloucester, a large crowd gathered at the Cross. Although the team did not arrive back at Gloucester station until midnight, they were greeted by a brass band, and the players were carried shoulder-high through the City. WB summarised his season in the Citizen – “F M Luce and G F Collett were found useful early in the season”. Throughout his time with Gloucester, his Army commitments restricted his availability, and Gilbert did not appear for the Club again until the 1901-02 season. Nevertheless, in the summer of 1903, he was a member of the British team, along with Frank Stout, which toured South Africa. 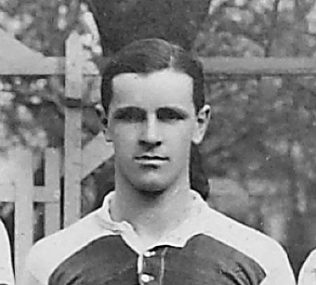 Gilbert played in twenty of the twenty-three games, winning three Test Caps. He did not play for Gloucester in 1903-04, but made one final appearance at Kingsholm against Stroud on 29th October 1904, a game which Gloucester won 18-8. He finished his Gloucester career with 48 appearances, 12 tries, 6 conversions, 2 penalties and 2 dropped goals. He never won an international cap with England, and yet he was a British Lion. Reminiscing in 1946 about the four very successful seasons enjoyed by Gloucester in 1896-1900 under the captaincy of Walter Taylor, WB wrote in the Citizen that “players who figured prominently with the captain in the many successes recalled, included … F M Luce and G F Collett (both of whom gained Blues at Oxford and Cambridge respectively)”. By 1911, Gilbert had gone into the family chemical manufacturing business, J M Collett and Co Ltd, and was living with his parents at Kimsbury House, Gloucester. As a pre-war Territorial officer, Gilbert began the Great War as a Captain in the 1/5th Battalion, Gloucestershire Regiment, with his brother, Lieutenant-Colonel John Henry Collett as the Commanding Officer. Gilbert landed in France on 29 March 1915, in 1916 he was promoted to Temporary Major, and later was appointed to command the battalion with the temporary rank of Lieutenant-Colonel, a rank he relinquished together with his command on 1 November after having been hospitalised following a wounding. Upon his recovery he took command of the 2/5th Gloucesters between April 1917 and March 1918. He was awarded the Distinguished Service Order (DSO) for distinguished service under fire, and was Mentioned in Dispatches three times. He continued his career in the Army after the war and retired from it in 1934, before re-joining the family business. On the death of his brother, John, in 1942, Gilbert became Chairman and Managing Director of the firm. Gilbert died at Battledown Gates, Cheltenham on 26th February 1945, age 65.